According to Apple Press, Apple has announced that it has sold more than 13 million new iPhone® 6s and iPhone 6s Plus models, a new record, just three days after launch. 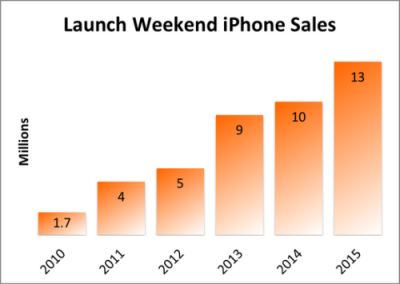 but these numbers included China sales, something last year’s debut-weekend sales — a record at the time — did not. The new handset easily beat the iPhone 6, which was in 10 million consumer's hands by the same three-day period a year ago. One thing that needs to be mentioned is that it is for the first time, the iPhone 6s launched in China at the same time that it debuted in the US and Europe. The vast number of extra consumers in the nation, which is Apple's second biggest market, no doubt juiced sales this time. It doesn't diminish the feat, however, because the iPhone 6s and iPhone 6s Plus launched in just 12 countries, and will be available in 40 more starting on October 9th. When all is said and done, Apple's latest smartphones will be on sale in 130 country.